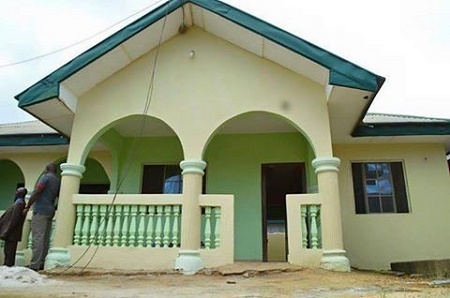 Apostle Chibuzor Chinyere, the General Overseer of Omega Power Ministries (OPM), has presented a two flat bungalow (one bedroom flat and two bedroom flat) to Precious Ndubuisi, the best graduating student of its ‘Free’ Primary and Secondary School in Port Harcourt. 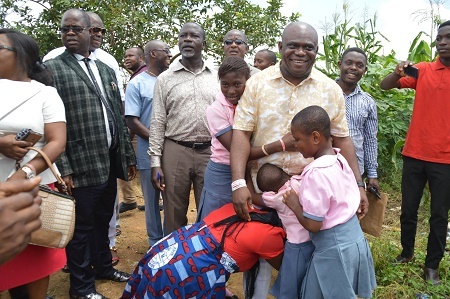 Chibuzor Chinyere while presenting the house to the family of Precious Ndubisi stated that the house gift was one his gesture to improve the quality of education in OPM school. He stated that he want students in the school to be very competitive among themselves stating that through such the creativity of the students would be unraveled. He also promise to furnish the house for the Ndubuisi family. ”I said that first, i want to be giving a plot of land to the best graduating student. So when I was looking for a land to buy for the pupils, so I started thinking that if you give a poor widow a plot of land, there are two things, either they sale it or farm on it and this people have accommodation problem. So what do I do, I said instead of getting the land, why don’t buy a house and I decided to buy the house. It is a one bedroom flat and two bedroom flat, so that she and her family can stay in one bedroom flat and rent the two bedroom flat. If she want, we can build a shop for her to start selling something. All these are coming from church offerings and tithes” he said. He stated that the women are gift from God and need to be respected and cherished in every family. ”Females also bring blessing. You don’t abandon a widow because she has only girls. Women are blessing from God. Ngozi Okonjo-Iwuala is a blessing and so many other persons. This girl is not related to me. I am from Abia State and they are from Elibrada in Emohua Local Government of Rivers State. Is not that OPM is giving the house to his own family members. As long as you are a Christian, you are my family”, he stated. He added that church offerings and tithes should be used for the welfare of church members and not to be used by the Pastors.